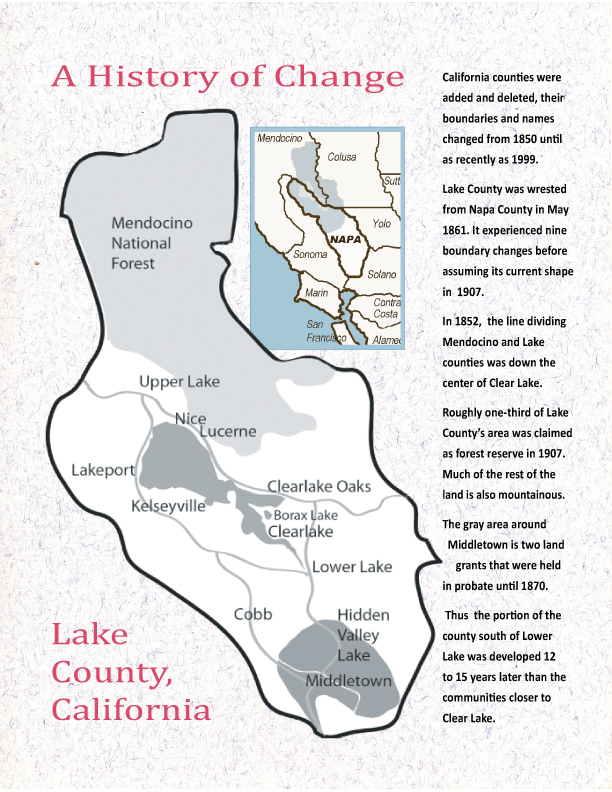 Lake County was founded in 1861, at the insistence of the growing number of settlers in Lower Lake, Lakeport, Upper Lake and Kelseyville. Its western boundary is delineated by the peaks of the Mayacamas mountain range. Mt. St. Helena marks the extreme of its southern border. Other mountains of the Coast Range ring the northern and eastern county lines, so that Lake County has always been considered somewhat inaccessible. Despite almost two dozen attempts around the turn of the century, the railroad never came to Lake County, nor did the freeways. For an area only 100 miles from San Francisco, Lake County remains surprisingly rural. The 1870 U.S. Census tallied 2,969 residents; and in 2010 only 64,665. In 1858, residents persuaded Napa County to form the Clear Lake Township in the portion of that county north of Calistoga. This became the nucleus of Lake County, with bits and pieces of adjoining counties added over the years. At the time of Lake County's birth, there were but a handful of settlers south of Lower Lake. on the vast expanses of the two ranchos. Another hundred families would be courted to lease properties in hope of future purchases by the ranchos' executors. They would plot the village of Guenoc. almost all of the tillable valley land south of Lower Lake. Those two properties were held in probate for fourteen years after the death of their owner, A.A. Ritchie, in 1856. Callayomi was cleared for sale late in 1870 and Rancho Guenoc two years later. That was the beginning of Middletown.